Kettering Town and Corby Town saw their respective matches called off due to the arrival of snow this evening (Tuesday). The Poppies’ home clash with Coalville Town was postponed after referee decided the pitch at Latimer Park was unplayable just before 6.30pm. 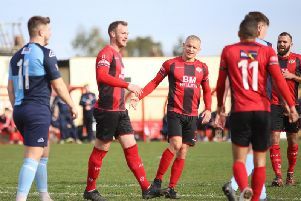 It means the Poppies remain a point behind Evo-Stik League South Premier Division Central leaders Stourbridge with two games in hand ahead of the clash between the top two in the West Midlands at the weekend. The Steelmen’s Division One Central encounter at Welwyn Garden City fell foul of the wintry conditions just after 7pm. The Corby squad and officials had already arrived at the ground, only to be greeted by a blanket of snow on the pitch. Steve Kinniburgh’s team remain in third place and five points off leaders Peterborough Sports. They will hope to return to action when they host Bedford Town at Steel Park on Saturday.